Jessica and Doug Payne welcomed son Hudson on Dec. 24. Photo courtesy Payne family. 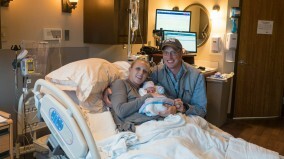 Eventers Jessica and Doug Payne welcomed their first child, son Hudson William Payne, on Dec. 24. Hudson was born at Aiken Regional Hospital in South Carolina and weighed 6 pounds, 13 ounces at birth.